During the process of discovering novel drugs, biopharmaceutical industries produce large number of formulations with small recipe variations. One important aspect in the characterization of new drugs is their viscosity fingerprint (i.e. viscosity dependence in shear rate and temperature). Viscosity is a good indicator of small concentration and molecular structure changes that play a key role in the efficacy of the final product. However, in the early stages of development, available sample volume for testing and characterization is very limited. Conventional rheometry often requires large sample volume (in the order of 1 mL or higher). 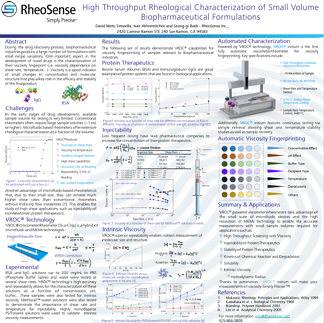 Microfluidic based rheometers can offer extensive rheological characterization at a fraction of the volume. A single point viscosity measurement can be performed with just a few uL. Another advantage of microfluidic-based rheometers is that, due to their small size, they can achieve much higher shear rates than conventional rheometers without inducing flow instabilities. This opens the door for the study of high shear applications such as injectability of non-Newtonian therapeutics. In this study, we introduce a hybrid of microfluidic and MEMS Viscometer/Rheometer On a Chip, together with its key applications. This technology is amenable to automation, allowing high throughput and robust measurements of viscosity that require little to none user assistance during testing. We present automated viscosity measurements of Bovine Serum Albumin (BSA) and Immunoglobulin G (IgG) as a function of shear rate, temperature, concentration and pH. These are used to determine protein stability and melting temperature. Additionally, this technology presents superior repeatability that allows for intrinsic viscosity measurements. Intrinsic viscosity can be used to establish molecular size in the formulation environment.